A few months ago I chewed over a poster presentation by Kevin Hall and associates which presented the findings of a detailed metabolic comparison over six days of an 800 calorie intake reduction of either carbohydrate or fat alone in a crossover design. I was concerned about an apparent imbalance in calories / carbohydrate balance that suggested the reduced carbohydrate (RC) phase was depleting glycogen reserves and hence the study was not of a steady state condition. I general I like the work done by Hall as I have a similar modelling background. There are however remaining concerns now that the full version of the paper has been published in Cell Metabolism. On the left we can presume that the ~800 kcal/day reduction in dietary fat intake was replaced by fat from body stores, as everything else is shown as the same. At 9.4 kcal/g that's a fat loss of 85 grams/day which is in line with the stated "89 ± 6 g/day of fat loss" for the RF diet (at 9 kcal/g it's a near exact match). So far so good. On the right life gets complicated. The reduction in carbohydrates allows fat oxidation to flourish to the tune of +400 kcal/day - the reason people like me favour carbohydrate restriction. So the subjects are burning 400 more of fat but 500 less of carbs and hence energy consumption has dropped by about 100 kcal/day. Although burning 500 kcal less of carbs the intake of CHO has been reduced by 800 kcal - so 300 kcal ( 81 grams/day) has appeared out of the woodwork, or more likely out of the body's glycogen stores. With 300 kcal of bonus fuel entering the mix the fat loss of the restricted carb diet is impaired - with the same fat intake it relies on increased oxidation and this only rose by ~400 kcal/d which is indeed only half of the reduction of intake seen in the fat restricted phase. 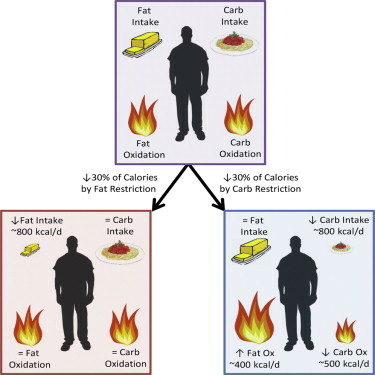 The question remains as to how long this condition could be sustained before the additional carbohydrate reserve dried up and forced a further increase in oxidation of fat. A study for 6 days isn't even half of the Atkins induction phase and the carbohydrate intake here was ~140 g/day which is well north of any "Low carbohydrate" diet let alone anything ketogenic. A secondary question arises from the fact that supplementary table S3 shows that there was no significant fat loss in the female subjects on either diet - in fact their % body fat went up (NS). I shall be returning to this study to focus on the men who did at least lose weight and reduce their fat mass significantly. I always prefer single gender studies as so much variability is added and significance lost by combining men and women.